Hurrah !! It's Friday !! Wow, it's took some time coming this week! It's also the official end of 30 Days of Purple, although there is one more mani to come. This does make me sad as I have LOVED this challenge, but you know, the elves want to get their mani on, so whaddya gonna do? Today's mani is not what I planned or what I expected. It turned out 100% different to my intentions, but I still love it. How cool is that ? 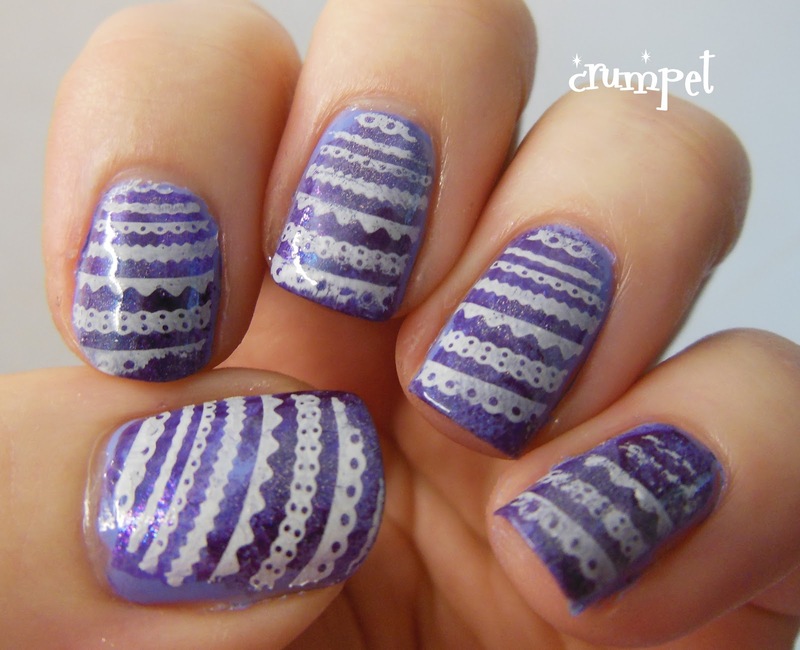 This was SUPPOSED to be an Aztec stamp over a mixed purple base. On the Dash 18 plate, the stamp looked very Aztecy - on the nail, not so much ha ha, although that might be because I decided to use white rather than black for the stamping. I do like the effect though - I think it looks like a cross between lace, bunting (those little flags on a string that hang down) and also, like a pair of crazy tights! The base was gorgeous, but you can't see it very well. It's a Splodgerama, which is a technical term I am coining, and I will do a tutorial on it soon, because it's such a cool technique for bases. It's a bit like a gradient, but with a lot less structure. 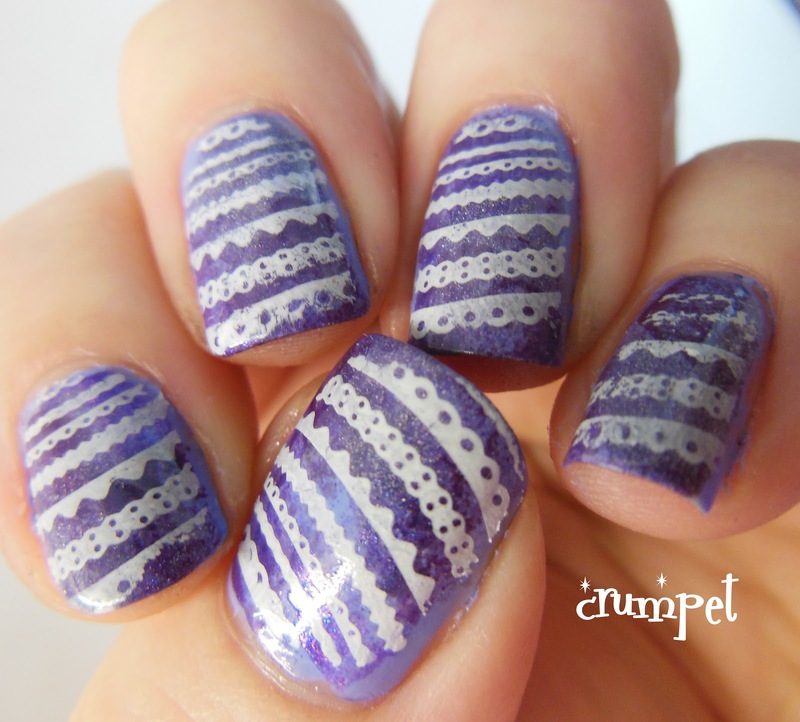 I probably used 5 different polishes for this, sponging them randomly around the nail. An interesting fact - I've been trying to square my nails off recently, to see if it gives them a better shape for blogging, and it really amused me that this stamp rounded them off again! 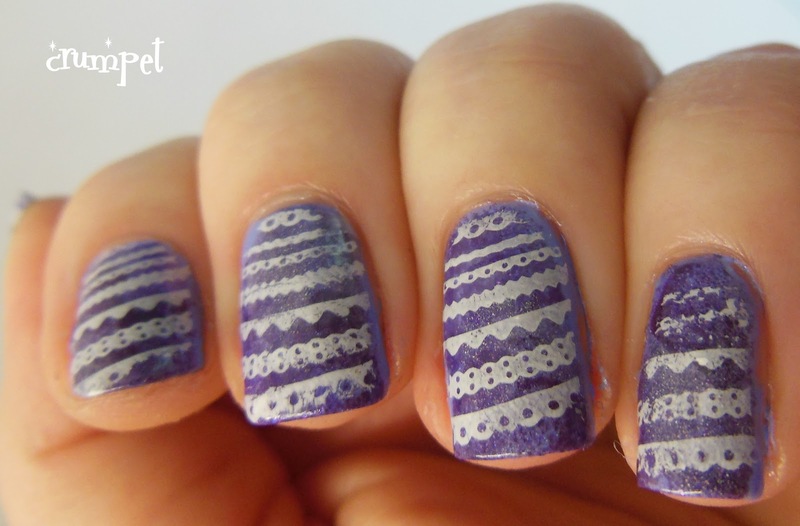 It creates an optical illusion that basically changes your nail shape - cool! I really hope you've enjoyed these last 30 days. It's been simple, but also quite freeing. Just me, my favourite colours, and some imagination. It's the least pressured I've felt in a long time.